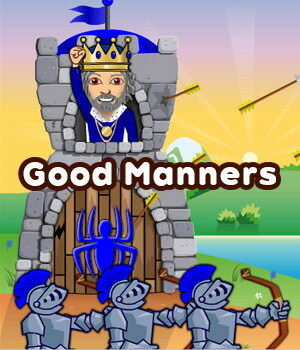 In this lesson, ESL kids learn how to talk about good and bad manners. 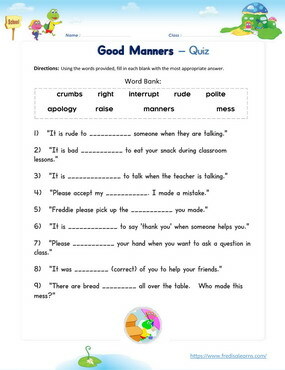 The lesson teaches a number of adjectives followed by prepositions, used when talking about polite and rude behavior. The worksheets below are useful for offline and classroom activities. 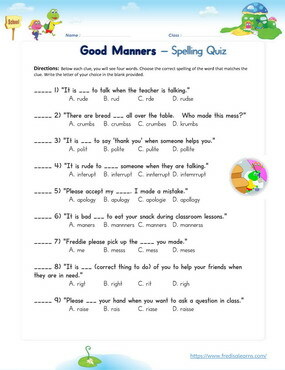 These printable exercises directly correlate with the above lesson 'Good Manners'. Every worksheet comes with an answer sheet on the second page for educators. Freddie is feeling very hungry and decides to eat his snack during lessons. 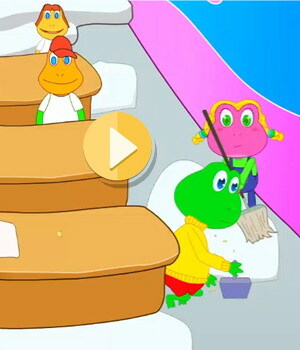 Ms. Ann is not amused and teaches Freddie and the other students about good and bad manners. Freddie is not at his best today and doubles down on his bad behavior by spilling his crumbs everywhere. Ms. Ann asks that he clean up the mess. Lisa helps him to do it quickly. These actions derail the math lesson of the day, leading Ms. Ann to teach them about good and bad manners instead. It is polite to say 'thank you'. It is rude to interrupt someone when they are talking. It is rude to talk when the teacher is talking. It is right for you to say you're sorry when you make a mistake. It is right of you to help Freddie.